Concept Living Brought to Life. It was a new way of thinking for a new way of living. 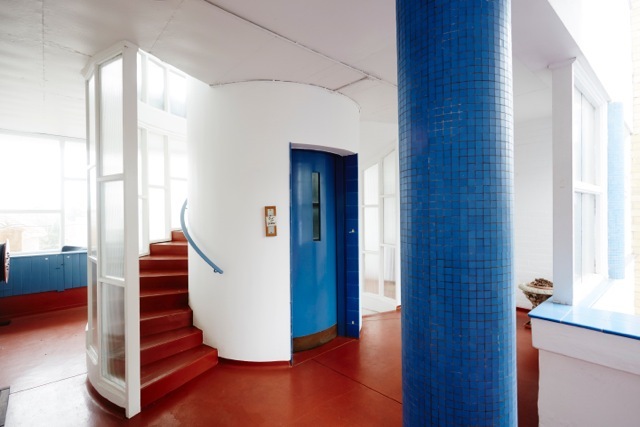 A vision that made Sir Roy Grounds a defiant force In exotic linear living. 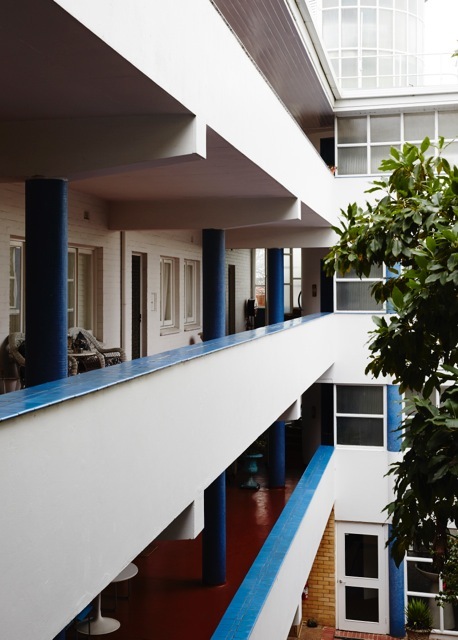 Roy Grounds' building broke the mould in 1941 and continues to influence it's peers today. 'Moonbria' is located between the leafy streets of Toorak & Malvern roads, Melbourne Australia. Take a moment, grab your Tardis and lets go back in time to 1941. World War Two is underway, (quite literally) and Australia is undergoing a massive change in how it thinks about funding new developments. Along comes Mr. Roy Grounds and offers one solution. 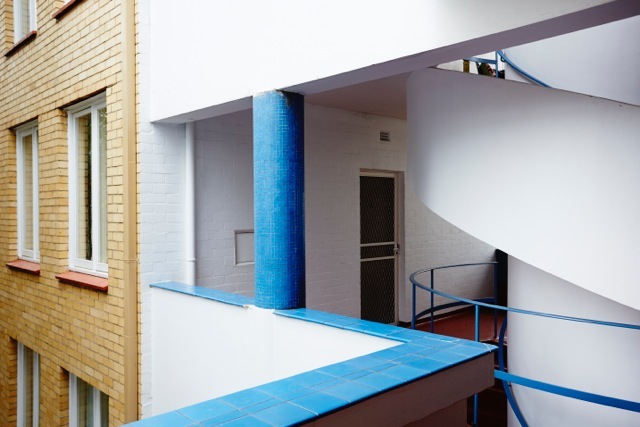 A building that employs many new building practices, whilst offering its residents 'eye-candy-curves' at every bend. Moonbria was born, and in time it was to earn Mr. Grounds a host of accolades from the glitter-atte of architectural design. Everywhere you look the residents at Moonbria are spoilt with eye-catching perfect views over the central framed courtyard. Mr Grounds was insistent that the 'big old tree' be kept and that his design 'would simply have to work in harmony with it.' Today this type of harmonious natural thinking is common place, but in 1941 it was radical. 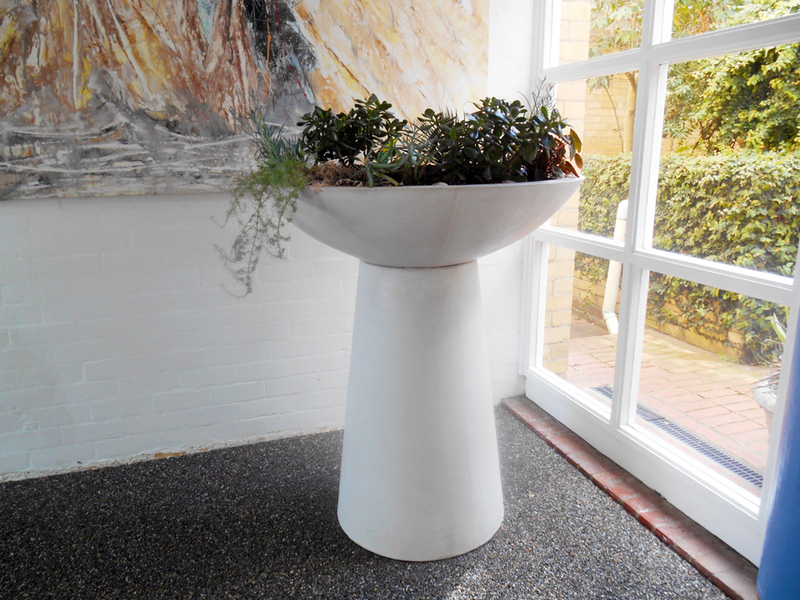 The fabulous planter set in the main foyer area glimpses the garden and works harmoniously within the buildings overall design ethos. Very nice indeed Mr. Grounds. 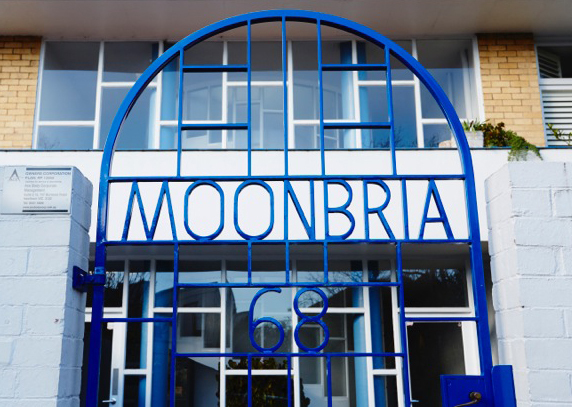 Moonbria contains just 21 residences all arranged around a central courtyard containing the most beautiful elm tree. If you've ever been to the Guggenheim Museum in NYC you'll know exactly what we mean. Moonbria's concrete-curves swell echo and play to all your visual senses. The top floors ceiling height is lowered slightly and then lined from east to west with wood paneling that echoes the ocean liners design cues that were so prominent and influential in the Art Deco/Moderne era. Roy Grounds, caught this influential bug from his time in London, came back to Australia and had fun. The rest is history. 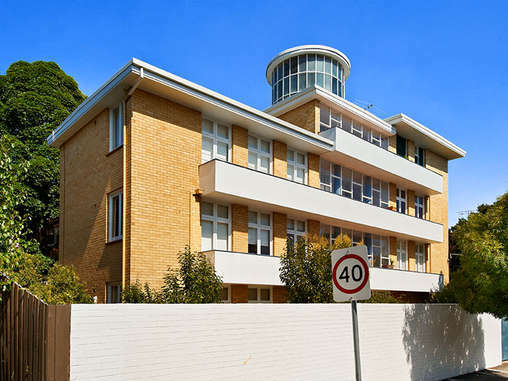 Roy Grounds had a select group of forward thinking well-heeled avant-garde clients, and in 1939 one of them asked him to build 'something good' on a vacant bit of land they owned at 68 Mathoura Road in Toorak. The brief was simple; It had to leave the past behind, welcome in the future and be a jolly good place to rest your head at night. Its radical design wasn't an instant hit with the Toorak gentry, but then again it wasn't meant to be. In the 1960's along with Howard Lawson's Beverley Hills in South Yarra hoards of artists fringe dwellers and musicians alike called Moonbria their creative sanctuary. The Jazz pianist Tony Gould along with the Myer's family personal butler were some of the buildings more in-famous occupants.